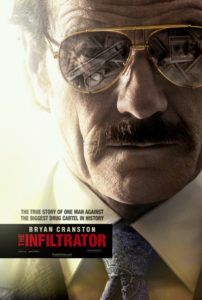 Bryan Cranston once again plays a man whose life revolves around the drug business in The Infiltrator, perhaps his best post-Breaking Bad role on film. But rather than cooking meth in various clandestine labs, this true story finds him playing an undercover U.S. Customs agent who goes after the Pablo Escobar cartel. If you’re wondering how a two-hour film could outperform Netflix’s more exhaustive original series about Escobar, called Narcos, which is about to air its second season, then look no further than Cranston himself, who appears in a role that is either typecasting or stunt casting—I can’t decide—since Cranston plays the moral opposite of someone like Walter White. Nevertheless, the affable actor habors much humanity and soul as real-life agent Robert Mazur, whose book of the same name provided the basis for Ellen Brown Furman’s screenplay. A more cynical viewer than myself might watch The Infiltrator and describe its scenario as well-treaded to the point of being worn out. But I would argue that no story, no matter how many times it’s been told, becomes worn out; it’s the filmmaking that makes the story feel stale. 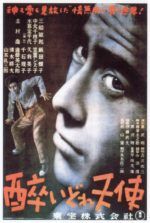 After all, audiences have seen this sort of undercover drug bust yarn before; they all contain the same basic story elements: A good cop goes on a dangerous undercover mission to catch the bad guy, except the bad guy has a good side, and our hero finds betraying the bad guy’s trust increasingly difficult. Also, being on the bad side is dangerous, which scares our hero, because he likes the danger, even though it turns him into a monster. And if the hero has a personal life outside of his cover, it’s tested to the brink… This basic formula could be applied to dozens of films like Point Break (1991), Reservoir Dogs (1992), Donnie Brasco (1997), Miami Vice (2006), and so on. Telling the story of Robert Mazur, The Infiltrator follows this familiar trajectory to the letter. Cranston plays Mazur, who, in 1986 after his latest collar, has an opportunity to retire alongside his wife Evelyn (Juliet Aubrey) and their two children. But when a brash colleague (John Leguizamo) comes to him with a new case, Mazur can’t resist a much larger bust, and promises his wife it will be his last. Rather than another sting operation focused on individual shipments of drugs, Mazur comes up with the idea to go after the drug money laundering process, which could lead to the cocaine kingpins and their so-called “legitimate” business associates who produce clean drug money. To do this, Mazur creates a new identity: Bob Musella, a banker with alluded mob ties. Instead of having to meet in dark venues to witness the exchange of drugs for cash, he’s wearing tailored suits, driving a Rolls-Royce, and shaking hands with international bankers. After working his way through a series of mid-level, but-no-less-dangerous cartel contacts, “Bob” must maintain that he’s engaged to Kathy Ertz (Diane Kruger), a younger agent on her first (and only) undercover mission. The phony couple befriends Escobar’s primary money-mover, Roberto Alcaino (Benjamin Bratt) and his wife Gloria (Elena Anaya). The two couples become intimate friends, and though Bob’s conduct with the Alcainos and even his fake wife Kathy almost cross a moral line, he maintains his professionalism, albeit conflicted. The planned sting involves a takedown of several players in Escobar’s organization, as well as the Bank of Credit and Commerce International, the seventh largest bank in the world at the time. On the sidelines, Amy Ryan and Jason Isaacs have underwritten roles as a tough police chief and a (curiously always disheveled) prosecutor, respectively. Cranston’s role reminded me of Al Pacino in Dog Day Afternoon (1975), given his balance of explosiveness and sensitivity. Consider the scene where Mazur takes his wife out for their anniversary dinner, but then he’s spotted by a cartel associate and must switch into a savage brute before his wife’s very eyes. One moment he’s eating swordfish with his wife; the next he’s slamming a server’s head into a chocolate cake. Thanks to Cranston, moments like these prove telling in The Infiltrator, because this scene and several others are about Mazur’s relationship with his wife or struggle with a double-life, as opposed to exalting Bob’s criminal lifestyle. Fortunately, the film never glorifies the freedoms and luxuries afforded by the cartel’s drug money. Instead, it’s scary as hell. As one of Mazur’s undercover informants (Joseph Gilgun) reminds him, the cartel will torture Mazur’s wife and children if they ever discover his real identity. Just as he delivered a solid Grisham-esque courtroom thriller with The Lincoln Lawyer, helmer Brad Furman’s work on The Infiltrator represents capable filmmaking. Working alongside his screenwriter-mother, the director creates several tense scenes that, again, largely thanks to Cranston and his expressive face, deliver palpable tension. There’s a crazy sequence where the cartel tests Bob’s credibility with a witch doctor, and the result leaves us just as breathless as Cranston appears to be. Formally, cinematographer Joshua Reis’ lensing looks sweaty and at times grainy, evoking the 1980s period and largely Florida-set locales. But the visual presentation doesn’t call attention to itself, which is true of the entire production; and even though this quality may prevent the film from reaching greatness, it means the film does just well enough. 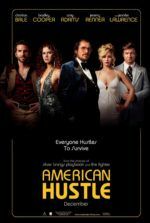 Overall, Cranston leads a cast of strong supporting actors in an entertaining and effective, if familiar, undercover cop thriller.